Mango Pico de Gallo and Fajitas! You are here: Home / Recipes / Dinner / Mango Pico de Gallo And Fajitas! 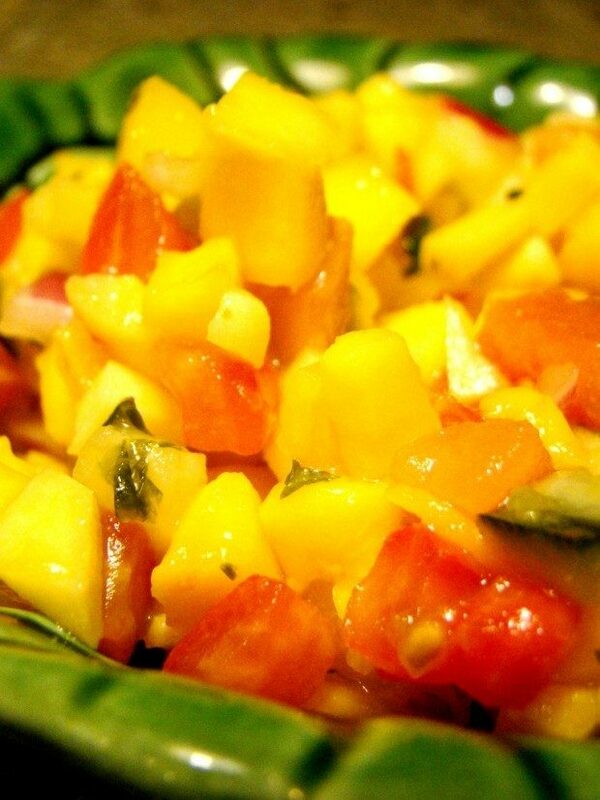 Chop all the vegetables and mango in very small pieces. Squeeze the entire lime over the mixture. Make sure this is a large, juicy lime. Put the mixture in the refrigerator for a couple of hours in order to meld the flavors. Serve with chips or over soft tacos or fajitas. Slice your vegetables and mix in a gallon size Ziploc bag along with 2/3 of the fajita seasoning packet. I just used a store brand. Let it marinade in the oil and seasonings for about an hour. Then pour them into a skillet and saute until a little tender. Set the vegetables aside. Put a little of the olive oil in the skillet or griddle and add the meat, sprinkling it with the remainder of the seasoning packet (if you think it is needed). I used a griddle and spread the olive oil over it with a paper towel before adding the meat to it. Heat the pre-cooked meat thoroughly. Of course, fajitas and veggies cooked on a grill would be the best, but these indoor fajitas were quite easy and tasted wonderful. Heat the corn tortillas in the microwave. Serve them with fajita meat, the vegetable mixture, Mango Pico de Gallo, sour cream, salsa and pinto beans. Hi, my name is Susan and I love cooking, watching the Food Network, reading cookbooks and, of course, eating. I am also an artist and spend time each week in my studio (bedroom) oil painting. I am a mother of four and a grandmother to 5 and that, along with my husband and 2 dogs, take up my most of my time. I am a side-tracked Home Executive and I had the privilege of being a stay –at-home mom so, you might say that my passion is the home and making a haven for those I love. I am quite skilled at shopping 🙂 and finding a bargain just makes my day.